After shelter and water, food is the key to survival living. 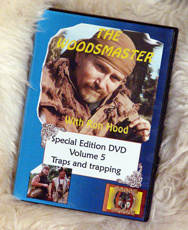 This DVD covers the basic "engines" of machine type traps, techniques for setting and using snares, trigger designs, where to set your traps and much more. If you can?t feed yourself after watching this video... you need a supermarket! Feed yourself for a lifetime! This new edit of the original footage includes special Slow Motion Scenes so you can actually SEE the operation of various traps.